I take my first few bites (aka half a sandwich) and yeah, it tastes like cookie dough. I mean, just look at all those swirls. It's unavoidable and fun to look at and it makes a fine first impression. While eating the second half, let me put my critical reviewer hat on. While you eat these you will probably come to one of three conclusions. 1, you will love them, and I am fine with that. 2, you'll like it, but debate if it's too sweet. 3, you'll like it, but wish there was some texture variation. See, first I was going to complain that there are no chocolate chips with the cookie dough swirls, but technically I have the shell. Thing is, that's not quite the same. Maybe they could add some chocolate chips to the shell, but that's probably too much to ask (or the pretzels from their pretzel bar). Speaking of the shell, this is one of the milk chocolate shells, not that more distinct klondike chocolate shells, and it plays second fiddle to the ever present cookie dough swirls. I don't know if the regular shell would have played better with the swirl, but I assume they tried it in both variations before going with this one. So, it's a fine treat, but as I linger here with the very sweet aftertaste, I debate how much I like them. On Second Scoop: Final score: wife 3, me 2, daughter 1. As I polished off the second one about an hour ago, I have to say, there's really no reason not to try these. I tried to eat this one a bit slower and yes it's sweet, but it's not too sweet. It's just... flavorful. It's not perfect, but at three bucks, sure, give it a shot. Why they didn't add chunks of actual cookie dough? That would had amped up the textural factor. 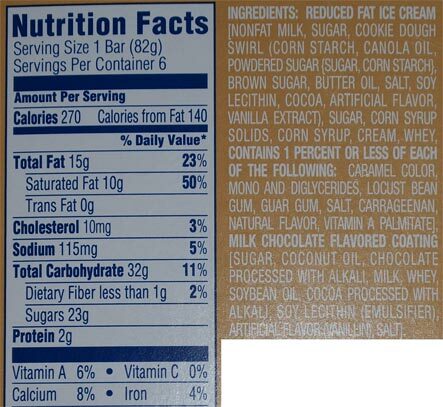 I'm still wondering why all novelties now have reduced fat or light ice cream - what gives? No more "frozen dairy desserts" for me. If I want something derived from skim milk, I would eat more gelato. I hope I am correct on that one. Either way, gelato is tasty! Cookie dough is the new salted caramel lately. Wish I liked it more. Sorry! I beg to differ. I just had one, and I don't think it tasted like cookie dough and I didn't see any swirls. @Anon: see if it's a one off or if the whole six pack is like that? If so, contact Klondike for a refund or some sort. I'd trust Dubba's analysis over mine, but I didn't fall into any of his 3 categories: I disliked these and would not buy them again. Grabbed these along with the Smores, but this Cookie Dough Swirl was not something I enjoyed. It does taste like some cookie dough ice creams (I think Blue Bunny and/or Breyers but could be misremembering) that I tried once and threw out, as opposed to Blue Bell, whose Cookie Dough I loved. 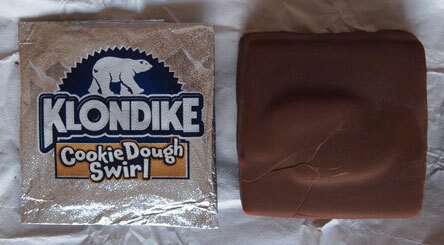 The initial taste of these Klondikes was fair at best, but the aftertaste was quite unpleasant to me. Again, if you like the cookie dough flavors of certain types of the low-moderately priced ice creams (I wish I could identify whose product these reminded me of), you'll like the taste. Worse, it's just cookie dough. Now, while that sounds like what I should have expected, "cookie dough" usually is "chocolate chip", which this was not (the shell doesn't count, at least for me). Fine, but it wasn't sugar cookie, snickerdoodle, peanut butter, oatmeal raisin, or any other different flavor I could identify. It just tasted very plain; at best, it was chocolate chip cookie dough without the chocolate chips (or other similar mix-in), and it really was like the foundation/base for something else, only that something else was never added. I don't think my distaste was due to it being reduced fat/light ice cream, as I prefer Dreyer's Slow-Churned to its Grand Flavors, so it's not like my tongue just rejects anything with a little less fat (and each of these still have 15g of fat anyway, and I think the packaging expressly says "not a low fat food.") And I liked the Smores, so it's not just an inherent dislike of Klondikes. Something nice...the swirls were present and did provide a visual contrast in the product. @Anon: if i had to guess, i would say it reminds you of blue bunny's version as it can be very sweet (and potent). I definitely get the annoyance with missing chips, but in their defense, they do say "cookie dough swirl" and as most swirls are viscous, there is less expectation to find little chip bits in them -- not that klondike hasnt mastered the tiny (but useless) chocolate chip in say their mint chocolate chip flavor. @Dubba: The presence of some form of chocolate (or other cookie ingredient) wasn't going to save this for me, but they easily could have put drops of chocolate ice cream the same consistency/texture as the swirl, or the same texture as the rest of the ice cream; hard chocolate chips was not what I was expecting, but I was expecting some sort of mix in/topping. These are exactly what they claim to be: cookie dough (whose taste I didn't like, but plenty of people obviously do); it was my fault for assuming that there would be some [blank] in front of the cookie dough, whether chocolate or sugar or snickerdoodle. I finally tried these and found that they tasted just like the regular Klondike Bars. The cookie dough swirl was more of a sprinkling of cookie dough as it was very lacking. Very disappointing!